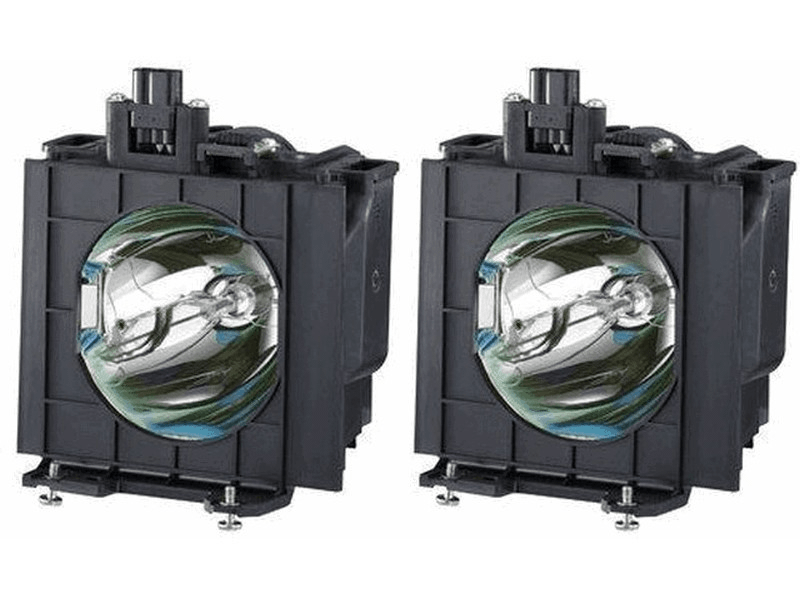 The ET-LAD40W Panasonic twin-pack projector lamp comes with genuine original 230 watt Ushio brand NSH bulbs inside rated at 4,000 lumens (brightness equal to the original Panasonic lamp). The ET-LAD40W Twin-Pack has higher lumen output and longer lamp life than other cheaper generic replacement lamps being sold elsewhere. It also has a Lamp Run-Time Module that is calibrated and tested during Pureland Supply's quality control process. Our lamps are guaranteed to operate the same as the original and will count your run time correctly to ensure proper function of your projector. ET-LAD40W Panasonic Twin-Pack Projector Lamp Replacement Projector Lamp Assembly with High Quality Genuine Original Ushio Bulb Inside. Twin Pack contains 2 Lamps. We had to replace 4 ET-LAD40W Twin-Packs for our Panasonic units and didn't want to take any chances. After researching and going through many reviews we decided on Pureland Supply and are very pleased with our choice. The lamps appear to be built better than some others we tried and they also seem to be brighter. Installation was easy and we didn't have any problems. This company is great and we would highly recommend them to anyone in need of a lamp. Great lamps and superior service - thank you! Excellent and honest customer service. Pureland is one of the few vendors that I have seen actually mention the onboard Lamp Hours counters for this model projector lamp assembly. The projector lamp assemblies I received from Pureland Supply had zero hours on the counters - a must if you have a "smart" projector such as the Panasonic PT-D4000U. Bulbs I have purchased from other suppliers in the past and been advertized as new (but actually remanufactured), but have not had their counters reset. Beware of these other suppliers. Perfect replacement sent out in a timely manner. Took us 2 days to receive our order. Most importantly this Panasonic twin pack works in our unit. The original Ushio definitely burns brighter than the generic lamps out there. We saved hundreds of dollars but didn't have to compromise on quality. Thank you for the great product and great service.